Quality Gaging Tips by George Schuetz and Jim McCusker, Mahr Inc.
By George Schuetz & Jim McCusker, Mahr Inc.
by George Schuetz and Jim McCusker, Mahr Inc.
Dimensional gaging is a dynamic field, with new developments in measurement devices and their application constantly emerging, but the underlying principles and core techniques are timeless. 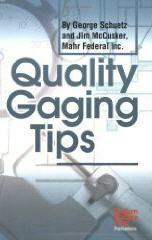 Quality Gaging Tips contains over 140 instructive articles (which originally appeared in a regular column of the same name in Modern Machine Shop magazine) that cover not only recent developments, but also the fundamental principles and basic techniques of dimensional gaging. The articles, arranged by topic to make it easy to find specific subjects when they are needed for solving problems or refining new techniques, present valuable insights gained from years of experience and knowledge, and each is designed to assist the reader to better understand the principles of gaging, and to improve their personal techniques. Both the science and the "art" of dimensional gaging are stressed, providing a full understanding of the methodology along with detailed instructions on how to perform specific tasks properly. Emphasis throughout is on problem-solving ability, inventiveness, and creativity. The wide scope and authoritative style of this book makes it the ideal on-the-job companion for anyone wishing to improve their professional skills in the science, and art, of industrial measurement.